Abrasive wear is due to hard particles or hard protuberances that are forced against and move along a solid surface. Abrasive wear is commonly classified according to the type of contact and the contact environment. The type of contact determines the mode of abrasive wear. The two modes of abrasive wear are known as two-body and three-body abrasive wear. Two-body wear occurs when the grits or hard particles remove material from the opposite surface. The common analogy is that of material being removed or displaced by a cutting or plowing operation. Three-body wear occurs when the particles are not constrained, and are free to roll and slide down a surface. The contact environment determines whether the wear is classified as open or closed. An open contact environment occurs when the surfaces are sufficiently displaced to be independent of one another. Adhesive wear can be found between surfaces during frictional contact and generally refers to unwanted displacement and attachment of wear debris and material compounds from one surface to another. 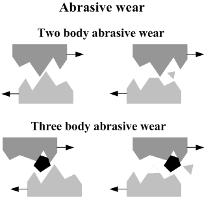 Generally, adhesive wear occurs when two bodies slide over or are pressed into each other, which promote material transfer. This can be described as plastic deformation of very small fragments within the surface layers. The asperities or microscopic high points or surface roughness found on each surface, define the severity on how fragments of oxides are pulled off and adds to the other surface, partly due to strong adhesive forces between atoms but also due to accumulation of energy in the plastic zone between the asperities during relative motion. There are several major types of adhesive wear. Sliding wear: any solid sliding on any other solid; Galling: severe form of adhesive wear; Scoring/scuffing wear: grooves and scratches in the sliding direction; Oxidative wear: mild wear in hard/hard unlubricated ferrous systems. In addition, there are four types of relative sliding motions to consider: unidirectional continuous, reciprocating, complex (slide, roll, etc. ), and intermittent. Erosive wear is caused by the impact of particles of solid or liquid against the surface of an object. The impacting particles gradually remove material from the surface through repeated deformations and cutting actions. The rate of erosive wear is dependent upon a number of factors. The material characteristics of the particles, such as their shape, hardness, impact velocity and impingement angle are primary factors along with the properties of the surface being eroded. To assist in the evaluation of wear and friction, DVI’s Tribology Experts will often times utilize the ASTM bench scale tests listed below. Our Tribology Experts have the experience to know how to properly choose the appropriate sub-scale bench test that will correlate correctly to the real world applications. Our Tribology Experts also have access to some of the most comprehensive Tribology test labs in the country, including highly specialized government facilities.